Posted on January 22, 2019 at 1:57 pm. How should your business think about Digital Marketing? Posted on January 16, 2019 at 11:46 am. We’re all going to die! I know that’s shocking but according to the headlines I read in December on CNBC we were heading to the worst December returns for the stock market since the Great Depression. You would think we were heading for impending doom. Oh no! Not the Great Depression. Let’s create all sorts of panic and despair. That’s what the media does. They want to create fear, turmoil and despair. Fear sells plain and simple. No one likes to read about all the great things going on in the world. And trust me there are lots of amazing things going on. Advances in science, technology, food, and medicine are literally changing the world as you read this. So why all the doom and gloom about the markets and why do people care what they have to say. I have no idea what direction the market is heading. There I said it! I am glad I got that off my chest. Now I am going to let you in on a dirty little secret. No one else knows if the market is going to go up or down either. Really smart people will go on TV with plenty of charts and graphs and they will talk about Death Crosses and Moving Averages and will pretend to know which way the market is going to go. Investing requires taking a risk. There is a 50/50 chance the market will go up or down on any given day. But based the so called experts of prognostication they can tell you what to own, when to own it and when to sell it. The reality is they can’t. They are taking an educated guess but at the end of the day they don’t know what direction the market is going to go over any short period of time much less any longer period of time. 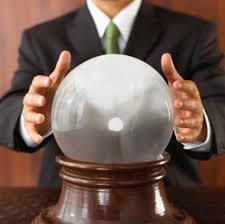 And that is no more apparent than when you look back at stock market predictions from the prior year. Barrons had 10 experts predict their returns for the S&P 500 for 2018 and all 10 were wrong. And wrong by a lot. The average of the 10 predicted approximately a 11% return for 2018. The S&P 500 returned -6%. The closet person predicted about a 4% gain. No one predicted it to be negative. And the experts were looking really good going into September and early October and then circumstances took over and this is what happened. The markets dropped a lot. What are they saying this year! The same 10 experts all say the markets may rally 10% in 2019. Should we believe them? I am inclined to agree that conditions are pretty favorable for decent returns in 2019 especially if the trade war with China gets resolved and the Fed remains reserved in their interest rate hikes. No one and I mean literally no one knows if the markets are going to go up this year. If we look at it over the long term and you say yes, you are going to be right 75% of the time. 75% is a high probability so why is predicting so hard? Because predicting by how much it will rise is nearly impossible to get. That makes predicting the markets a fool’s errand. So, do yourself a favor and turn off the CNBCs of the world and stop listening to “experts” on TV because they don’t know if the markets are going to go up any better than you do.